What Does a Bird's Beak Tell You About Its Diet? In this activity, students examine images of birds and make inferences about the bird’s diet and lifestyle based on the shape of their beaks and legs. Birds are very diverse in their habits, spear-shaped beaks are used for fishing, short stout beaks are used for cracking seeds, and the curved beaks of raptors are used for tearing flesh. The legs provide clues about the bird’s habitat. The long-legged birds are usually wading birds, and the 3 toes in front, 1 behind foot is found in birds who perch. 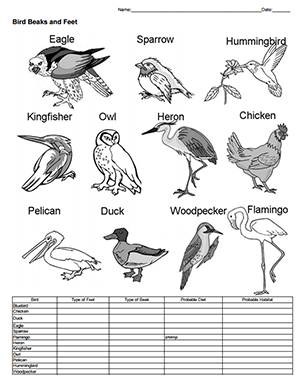 Students can look at the images on the worksheet, or you can make this a guided study where students view the birds on Google Slides. These slides contain real images and a few video clips that show birds as they hunt and consume food. The analysis questions ask students to compare how birds hunt and what they eat to show how competition is reduced among the different species. For example, owls hunt at night and falcons hunt during the day. The idea of the “competitive exclusion principle” is introduced here.